Following their attendance at Sundance, Zawe Ashton and Natalia Dyer jetted off to LA along with Charlie Heaton for the premiere of 'Velvet Buzzsaw at The Egyptian Theatre yesterday evening(January 28th) in LA. Zawe Ashton wore another look by ROKSANDA, this time from the SPRING 2019 collection. Her white layered silk-chiffon, flowy dress, featured a contrasting black print, and straps. This maybe an off-season piece but I am sold on it's easy, breezy vibe for the occasion. However I can't say that I am loving the make-up. Charlie Heaton looked great wearing a DIOR HOMME SPRING 2019 floral button down shirt and ivory trousers. However I wish that he wore brown or tan shoes over the black but her still looked great great. 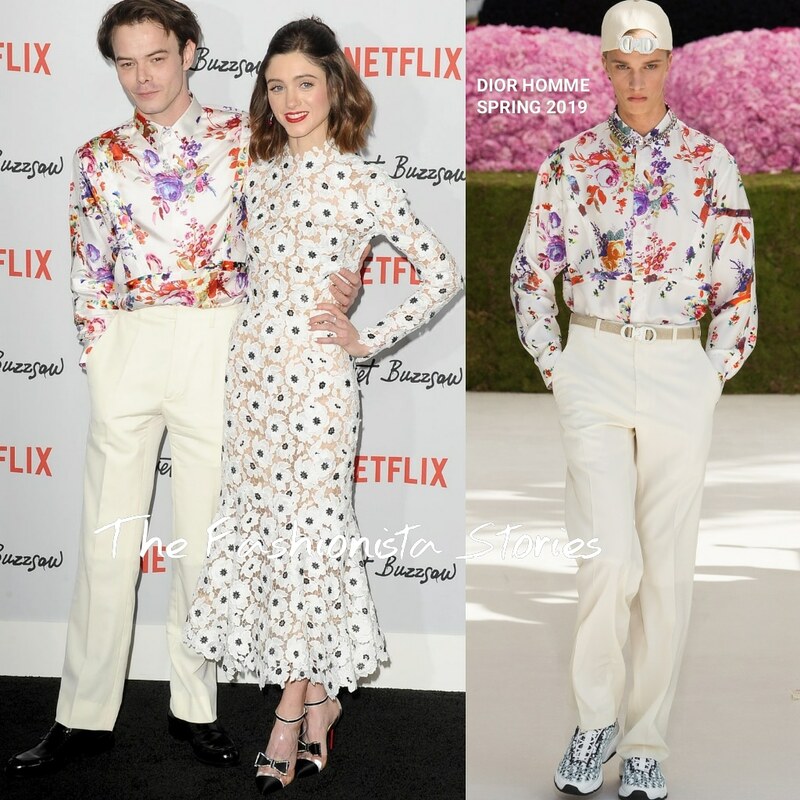 Natalia Dyer looked great as well wearing a long sleeve OSCAR DE LA RENTA anemone flower guipure lace dress which she accessorized with CARTIER jewelry and CHRISTIAN LOUBOUTIN heels. A half-up, half-down hairstyle and a bold red lip rounded out her look.